Check Me Out in the Erie Times-News! This article was originally published on GoErie.com. Meet Dogtor Gizmo, the dental therapy dog at Sleep Dentistry Erie. An Erie dental therapy dog is at the center of an effort to collect money and donations for area animal shelters. Dogtor Gizmo, who works with dentist Kevin Mahoney at Sleep Dentistry Erie, 3915 Caughey Road, helps calm patients who have dental anxiety as well as special needs patients. 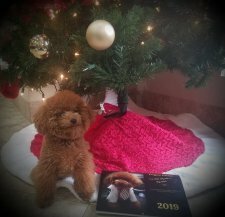 A photo contest on Gizmo’s Facebook page asked owners of adopted and rescued pets to submit photos in order to create a 2019 calendar. Calendars are available for purchase for $15 each at www.dogtorgizmo.com/calendar. Net proceeds will benefit the A.N.N.A Shelter; H.O.P.E., a community outreach program for animal-related situations; Millcreek Animal Hospital Angel Fund, and the American Society for the Prevention of Cruelty to Animals. An area also has been set up at the dental office for donations of food, bedding, toys, cleaning supplies and more that will be donated to the A.N.N.A Shelter. Dogtor Gizmo is available at the office on Tuesdays and Thursday, 10 a.m.-6 p.m., and Mondays, Wednesdays, and Fridays by appointment.